Sorry, there are 2 typing mistakes in the word succeeded; one at 2mn10s and one at 2mn25s. Harold, Earl of Wessex, Edward's brother-in-law, was immediately crowned king. 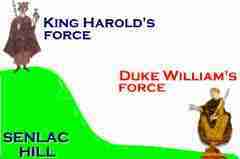 But Harold had sworn allegiance to William and had recognized him as the future king. 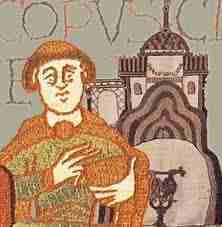 Odo of Bayeux, William's half-brother. a camp. Soon after, Harold and his army arrived. and his army collapsed. William was victorious. 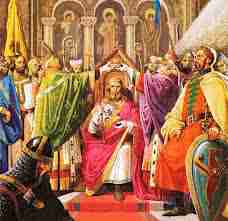 On Christmas Day 1066, William was crowned king in Westminster Abbey. 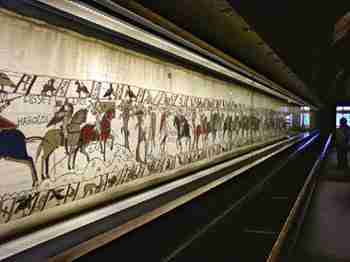 The Bayeux Tapestry is neither a tapestry nor a woven cloth. that you can see in a museum in Bayeux, France. probably made in Canterbury or Winchester by English needleworkers. 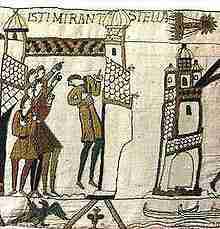 and the appearance of Halley's Comet (0:20) Six men are pointing at the star. Above them you can read 'Isti mirant stella', which means: 'They marvel at the star'. The annotations on the tapestry are in Latin. (the English words have been added in the video). Decorative borders along the top and bottom portray scenes from fables, farming, hunting and mythological figures such as lions and dragons. A 'motte' is a hudge mound of earth with a keep or tower on the top. can be housed. It is surrounded by a wooden fence and a ditch sometimes filled with water. 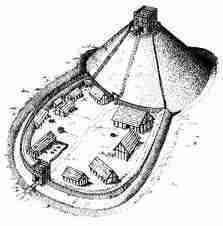 A Motte and Bailey castle could be built quickly (1 or 2 weeks). 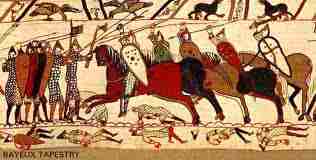 Spears and javelins are the most common weapons used by the Norman knights on the Tapestry. Other weapons used during the battle were axes, bows, maces and swords. 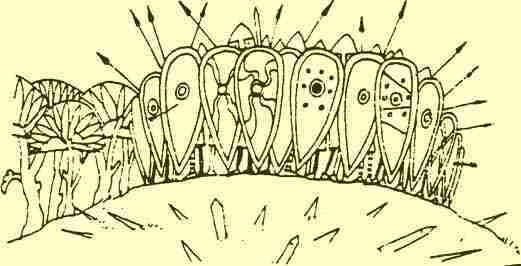 Shields were used for protection. Harold is crowned king despite his oath to William. A comet is seen as an omen. Harold sends a messenger to France. William is furious at Harold's betrayal. William orders an invasion fleet to be built. Weapons and supplies are carried onto ships. 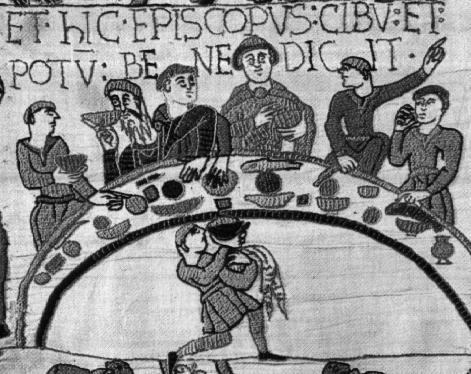 The Norman invasion sails across the Channel. 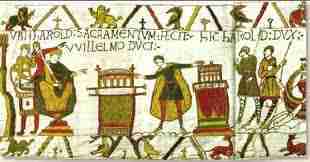 William's army lands near Hastings. The Normans set up camp. William's cooks prepare a banquet in his honor. A Motte and Bailey castle is built for defense. A house is burnt down to make way for the Norman army. The Normans outflank the Saxons. Lewine, brother of Harold, is slain. Both Saxons and Normans fall in the raging battle. William rallies his troops for a final charge. King Harold is killed in the battle. William'sHarold'sEdward'sI don't know army was positioned on Senlac Hill. and shot their first bowsarrowsspearsI don't know . The Saxon soldiers blocked the attack with their swordaxeshieldI don't know wall. cavalry charge,which was in vain. forming a barrier and Harold was woundedkilledtaken prisonerI don't know .